¡Received the book in a Giveaway!RATINGS : 4.7You know the feeling of reading a book, fully engrossed and yet puzzled by it; even in the end not knowing what it was that just clicked for you and made you feel deeply connected to every single person in it. Well, I just experienced it, and frankly, find it quite baffling myself. 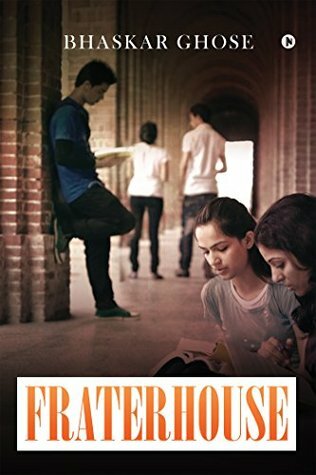 A novel where not much seems to happen, but a lot happens, that's what it feels like.The story resolves around Fraterhouse, a place of learning in the capital of India, Delhi, and the people who belong to it. Told from a wide range of perspectives, it enfolds readers into the world of the ancient college, one where a lot many things happen in the background along with its highly acclaimed education. A more of a central figure in these events is our main protagonist, Nirmal, who is quite the charming enigma till the end, but one who is also at war with himself. Focused around the time of change, the author has produced quite a beautiful piece, bringing the characters to life in magnificent ways.In all, a wonderful read, for old and young; a book which provides a perspective that's quite intriguing by far. Once in a while, you come across an unputdownable book.. the kind which draws you in, and even after it draws you back as you just know there may be parts where you didn't read between the lines. Fraterhouse is one such book. The characters are clear, yet layered. The nuances draw you back. It's compelling if you have some prior knowledge of the time period it was set in. As stories go, it's honest. And you will be drawn to re read again. Bhaskar Ghose - Bhaskar Ghose was educated in Mumbai and Delhi and joined the Indian Administrative Service in 1960, retiring from it after thirty-six years. He served in various capacities both in the government of West Bengal, the state to which he was assigned, and in the Government of India. He has held the posts of Director General, Doordarshan, Secretary, Department of Culture in the Ministry of Human Resource Development, and Secretary, Ministry of Information and Broadcasting. He has been a visiting fellow of Queen Elizabeth House, University of Oxford. For the last fourteen years he has been a writer and columnist, and has written regularly for a number of major Indian newspapers and journals, among them The Pioneer, Delhi, The Telegraph, Kolkata, and the Hindustan Times, Delhi. He presently writes a column for Frontline. He has been involved with theatre for the last fifty years and has acted in and directed over forty plays. His first book Doordarshan Days was published by Penguin/Viking in 2005.